Soft Skull Press, 9781593765361, 301pp. After her traditional engagement to her high school sweetheart falls apart, Liza Monroy faced the prospect of another devastating loss: the deportation of her best friend Emir. Desperate to stay in America, Emir tried every legal recourse to obtain a green card knowing that his return to the Middle East--where gay men are often beaten and sometimes killed--was too dangerous. So Liza proposes to Emir in efforts to keep him safe and by her side. After a fast wedding in Las Vegas, the couple faces new adventures and obstacles in both L.A. and New York City as they dodge the INS. Their relationship is compounded further by the fact that Liza's mother works for the State Department preventing immigration fraud. Through it all, Liza and Emir must contend with professional ambition, adversity, and heartbreak and eventually learn the true lessons of companionship and devotion. This marriage that was not a marriage, in the end, really was. 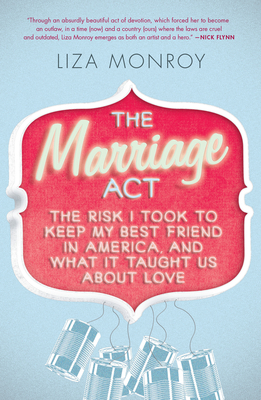 The Marriage Act is a timely and topical look at the changing face of marriage in America and speaks to the emergent generation forming bonds outside of tradition--and sometimes even outside the law. Liza Monroy is the author of the novel Mexican High. Her articles and essays have appeared in numerous magazines and newspapers. Her writing has also appeared in anthologies: Wedding Cake for Breakfast, One Big Happy Family, edited by Rebecca Walker, The New York Times' Best of Modern Love, and Goodbye to All That: Writers on Loving and Leaving New York. She lives and writes in Santa Cruz, California, where she teaches writing at UC Santa Cruz.